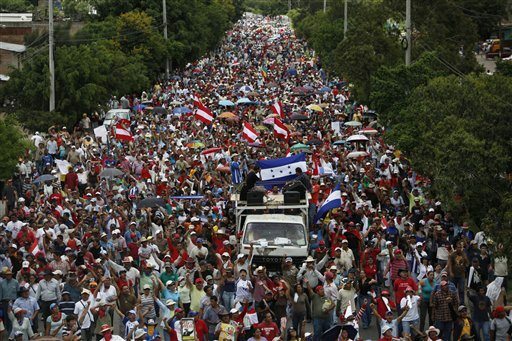 Thousands of Zelaya's supporters march to the capital's airport, July 5, 2009. Zelaya's jet was blocked from landing. TEGUCIGALPA, Honduras (CNN) — Deposed Honduran President Jose Manuel Zelaya said he was denied permission to land at Tegucigalpa’s airport Sunday evening after a deadly clash between Zelaya’s supporters and government troops. A plane carrying ousted Honduran President Manuel Zelaya flies over Tegucigalpa on Sunday. Zelaya told the Venezuela-based news network Telesur that his jet was denied permission to land in Tegucigalpa, where military vehicles were arrayed on the runway. The aircraft was en route to San Salvador, the capital of neighboring El Salvador, after what Zelaya called a “fruitless” attempt to land. At least one person was killed and eight wounded after security forces opened fire and used tear gas on protesters who ringed Tegucigalpa’s airport, said Hugo Orellana, a Red Cross director in Honduras. Protest leaders put the death toll at three. 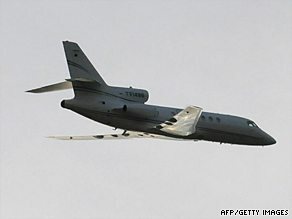 After being denied permission to land in Honduras, Zelaya’s plane made a stop to refuel in Nicaragua’s capital, Managua. 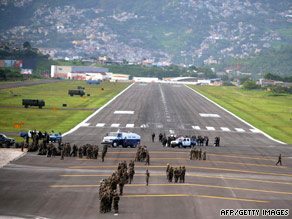 Police and military block the airport runway preventing President Zelaya's plane from landing. During the stop, he met with Nicaraguan President Daniel Ortega — who is a leftist ally of both Zelaya and Venezuelan leader Hugo Chavez — and told Telesur that his supporters had been trying to remove obstacles from the runway in Tegucigalpa when troops opened fire. “The people pulled back when fired upon,” he said. For the remainder of this article, go here. great! now i suppose we have to watch for a bunch of honduran restaurants opening up.